To reach the Darby Cemetery from Collinwood, Tennessee, travel Tennessee Hwy. 13 south for 4 miles turning right onto the Natchez Trace Parkway access road. Turn left (south) and go 8.6 miles. Turn right (west) onto Cooper Ridge Road. The cemetery is about .1 mile on the left. At the crest of a little hill, turn left and across the end of a field to the cemetery. It is about 50 yards off the paved road. 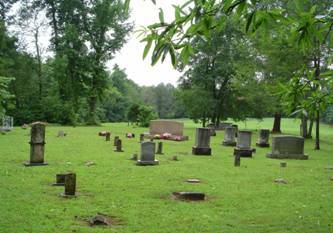 The Darby Cemetery is in extreme south/central Wayne County, Tennessee. The cemetery is fenced, relatively clean and maintained. This is an old burial ground and no church is nearby. The graves are scattered somewhat but there is ample room for more burials. The most recent burial was of John Richard Bone on March of 2003. This cemetery has at least 8 unknown graves, at least unknown to this surveyor. Curtis, Frank; b. 22 Dec 1888, d. 14 Oct 1910, son of J.G.& S.M. Darby, Dalton; b. 09 Aug 1920, d. 21 Apr 1941, son of J.H. and A.M.
Darby, Doyle; b. 31 Jul 1923, d. 0l Feb 1940, son of J.H. and A.M.
Darby, Homer; b. 17 Jul 1902, d. 15 May 1910, son of J. S. and L. E.
Darby, Ruby Zelmer; b. 29 Jul 1916, d. 05 Aug 1917, daughter of J.H. and A.M.
Lindsey, Henry J.; b. 05 Mar 1870, d. 03 May 1878, son of John P. & Martha A.
Martin, Dewey McKinley; b. 04 Apr 1899, d. 25 Aug 1909, son of Henry and M.P. Weaver, Birdie; b. 01 Jul 1903, d. 08 Oct 1905, daughter of J. W. and R. P.
Weaver, Hetty; b. 08 Aug 1862, d. 20 Apr 1898, wife of J. W.
Weaver, Hobert; b. 22 Apr 1900, d. 18 Oct 1905, son of J. W. & R.P. Wright, Sarah M.; b. 1863, d. 1918, wife of William A.
Wright, Willard Owen; b. 03 Jun 1916, d. 27 Aug 1917, son of C.H. and C. E.
Wright, William A.; b. 1868, d. 1955, husband of Sarah M.